The crawfish at the tiny biology prep lab in Wright State University’s Fawcett Hall live fairly tranquil lives in their aquarium. 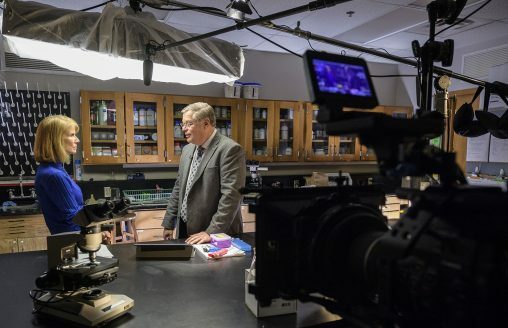 So it was no doubt a bit of a jolt to them when one of the world’s foremost DNA experts, a national award-winning television correspondent and a crew from the CBS-TV mystery newsmagazine “48 Hours” moved in to the lab with their lights, cameras and action. The Oct. 16 filming was for the purpose of having correspondent Erin Moriarty interview Dan Krane, professor of biological sciences. She wanted to tap into Krane’s DNA expertise for an upcoming “48 Hours” episode on an old murder case in California. “48 Hours” will air the episode featuring Krane on Jan. 26. The popular newsmagazine investigates intriguing crime and justice cases that touch on all aspects of the human experience. Over its long run, the show has helped exonerate wrongly convicted people and driven the reopening — and resolution — of cold cases. Moriarty, who has covered such important stories as the Oklahoma City bombing and the Columbine shootings en route to nine national Emmy Awards, has been correspondent for “48 Hours” since 1990. Krane began testifying as a DNA expert in 1991 and has since testified in more than 100 cases in the United States, United Kingdom and Australia. He probably among only three or four people sought out by shows like “48 Hours” for an objective academician’s perspective on DNA testing. For the interview, the five-person “48 Hours” crew transformed the tiny biology lab into a makeshift television studio. Three cameras, including two powerful digital cinema Canon C300s, were employed. A Keno fluorescent light hung from a boom to provide soft lighting, several light panels were set up for backlighting, and a handful of small Dedolights — 150-watt fixtures with built-in dimmers — were used to spotlight certain areas. The sound engineer worked to muffle any outside noise for the interview. Fans, pumps and even a refrigerator were unplugged to achieve acoustic purity. Krane is accustomed to television productions. In August, he appeared on ABC-TV’s “20/20” investigative journalism show answering questions about the DNA results in a high-profile, double-homicide case in Virginia. And in 2016 he discussed DNA testing on “Investigation Discovery (ID),” a U.S. mystery-and-suspense network that was exploring the 22-year-old murder of child beauty queen JonBenét Ramsey. “48 Hours” correspondent Erin Moriarty interviewed Dan Krane in the Fawcett Hall biology lab. “48 Hours” also filmed one of Krane classes and scenes around the Dayton Campus. Krane applauded Moriarty and the “48 Hours” crew. Krane was also filmed by “48 Hours” during a photosynthesis lecture to his freshman biology class in the Medical Sciences building. It is the largest class on campus, with 392 students. And a “48 Hours” photographer spent a considerable amount of time getting footage of the Wright State monolith at the campus entrance and Alumni Tower. Moriarty called Wright State “beautiful,” saying it is much larger than she expected. Moriarty was born in Cincinnati and raised in Columbus. She graduated from The Ohio State University, Phi Beta Kappa, with a degree in behavioral sciences and received a law degree from the university in 1977. She was the consumer correspondent for “CBS This Morning” from 1986 to 1990 and the “CBS Evening News with Dan Rather” in 1990. She has covered the death of Princess Diana, the JonBenét investigation and the war in Iraq. Drawing on her training as an attorney, Moriarty has examined some of the most important social and legal issues of the day, including DNA testing of evidence in death row cases, the abortion controversy and battered women’s syndrome. Her exclusive behind-the-scenes report on the defense of convicted Oklahoma City bomber Timothy McVeigh was broadcast on “60 Minutes” in 1997. Krane graduated with a bachelor’s degree in biology and chemistry from John Carroll University in 1985 and obtained a Ph.D. in molecular biology from Penn State in 1990. He did postdoctoral research at Washington University and Harvard before accepting a faculty appointment in 1993 at Wright State.